Siberian Iris are less impressive than Bearded Iris, but more refined and easier to grow. The flowers will hold up very well in wind and rain, and they require very little maintenance. An excellent border plant that will give up to 20 stems of flowers once it is established. Likes moist places. June bloom. Plant in fall or spring. See also our Caesar's Brother Siberian Iris by the Bushel for naturalizing large areas. You may also be interested in our Clump Specials. A collection of 10 each of our varieties – 10 Caesar’s Brother and 10 Snow Queen - individually labeled and packaged. Caesar's Brother Siberian Iris has midnight blue flowers on wiry stems with grassy foliage. Very adaptable and hardy. Does well in the South. See Also: Bushels of Bulbs for field-run Caesar's Brother Siberian Iris to naturalize large areas. You may also be interested on our field-run Clump Specials. 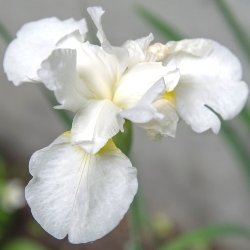 Snow Queen Siberian Iris has white flowers with bright yellow markings. Drought tolerant.